Success is important to REALTORS® but until now, REALTORS® have not easily known what personal and specific steps would help them fill-in the skill and knowledge gaps that are keeping them from success in the real estate industry! UpSkill Agent™ is the answer! This powerful, multidevice compatible tool developed specifically for the real estate industry by Learning Library Inc., the industry leader in online real estate education, will assess your skills in 6 key real estate competencies by simply answering a series of online questions. 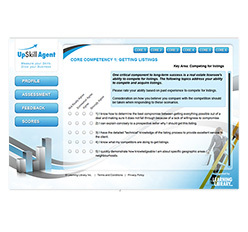 UpSkill Agent™ automatically provides a personalized score and feedback by competency that pinpoints specific areas to develop to help you be more successful. The report also provides an individualized list of specific leading-edge courses and products that would directly fill those gaps or simply use the report as a guide and fill in a local solution.